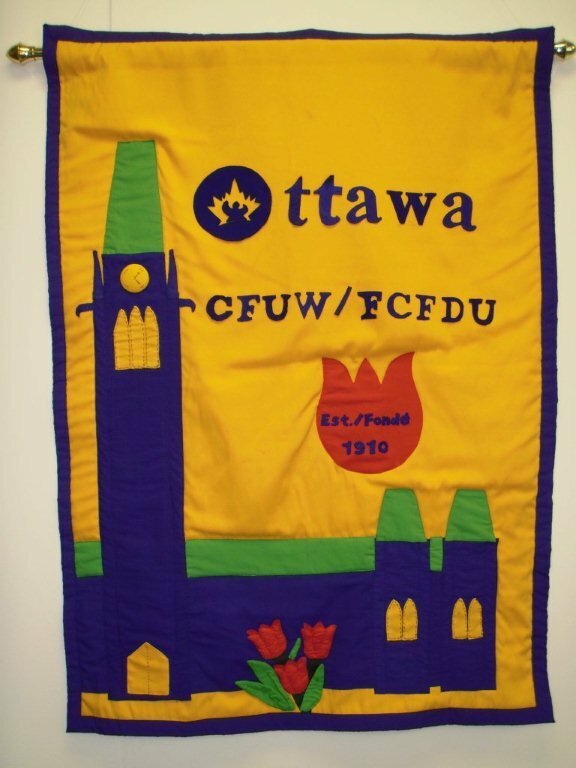 The CFUW-Ottawa banner is the visual symbol of our club and is displayed on special occasions and at meetings. It appears on our program and promotional brochures, and our Membership Directory. Our current banner was launched at the CFUW Ontario Council AGM in Ottawa on May 29-30, 2015. It incorporates CFUW's blue-green colour scheme and slogan: “The Power of Women Working Together” (in English and in French). The image of the Parliament Buildings was adapted from the logo created by Pat Paterson for the 2010 CFUW AGM hosted by Ottawa during our Club’s centennial year. Great photos of our Hiking, Madri-Gals, and Dragonauts Groups, represent the myriad activities of the Club. Our website address features prominently on the banner. The banner was developed during 2014-15 by Gayle Bertrand, former Membership Services officer at CFUW National Office, assisted by Charlotte Rigby, President, CFUW-Ottawa, and Mary Butterill, Carillon Editor. It was approved by the CFUW-Ottawa Board. Gayle had previously designed comparable banners for several other CFUW clubs using Adobe Illustrator software. The roll-up, very portable banner was produced cost-effectively by Vizual Tek Displays. In 2000-01, designs were solicited for a new Club Banner. This design by Sandra Choquette was selected. The voting members liked the folk art spirit of the design and the tulips and Peace Tower symbolizing Ottawa. Sandra was the Club's VP Liaison in 2000-01 when Ottawa hosted the International Federation of University Women (IFUW) Conference. The Banner was first displayed at the CFUW National AGM in Richmond, B.C. in August 2002.